Well, thank God for Barry Zito. Who would imagine we’d ever write that a week ago? But a lot of assumptions we had about the 2012 Giants in spring training haven’t been fulfilled so far in the regular season. We thought the offense would struggle. Nope. The Giants are averaging almost six runs a game so far this season. We thought Brandon Belt was going to rake. No. He’s hitting .091 this season. 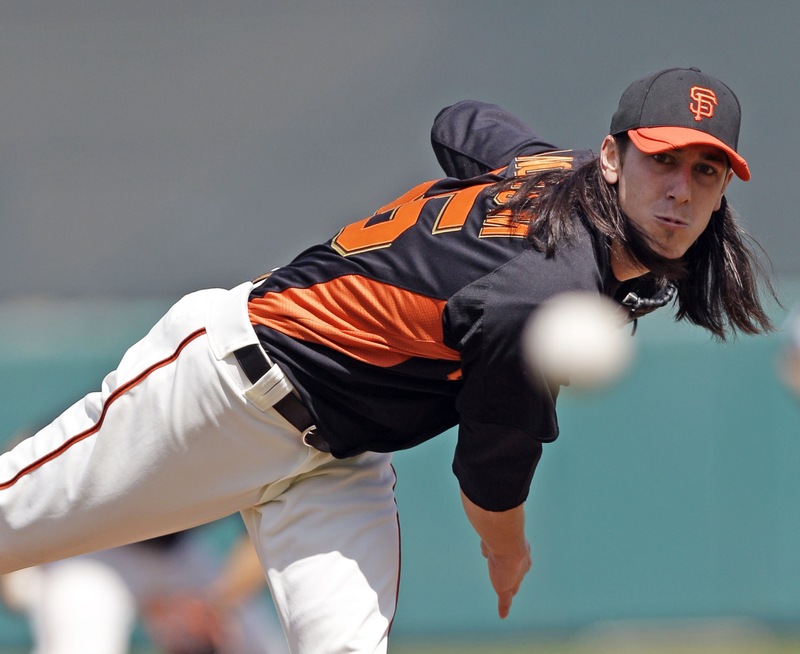 We though Tim Lincecum, Matt Cain and Madison Bumgarner were ready for the season. Well, so far we haven’t seen that, particularly from Lincecum. But before we get to the ugly details of Wednesday’s game in Colorado, let’s get to the stuff apparently everyone wants to know about — The Freak’s new haircut. 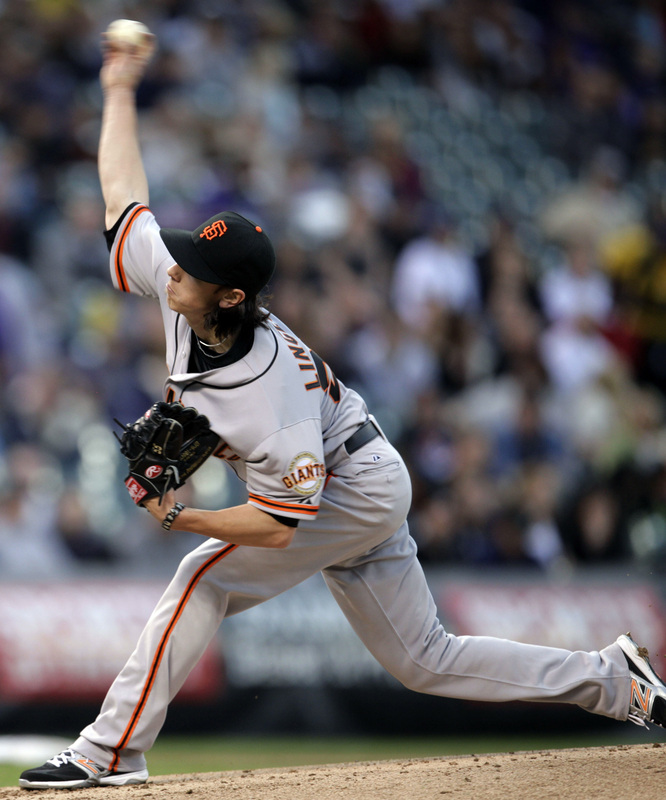 Lincecum had about 4 inches of length cut off his locks during Tuesday’s day off in Denver. But his hair was so long, it was hard to notice. So we’ve included a picture from Wednesday game with his new haircut, and one from spring training, so you could see the difference. The big difference we want to see is on Lincecum’s pitching. The Freak got knocked around for six runs on eight hits and two walks in 2 1/3 innings, the shortest outing of his career. Yet Lincecum needed 76 pitches to get seven outs. behind 0-2 or 1-2 in the count. “Just sloppy baseball for me,” Lincecum said. “Not really executing pitches, missing a lot, and it’s going to hurt you, especially in this park. If there’s silver lining, it’s that Lincecum wasn’t alone in his pitching struggles, leading some to claim that the Rockies didn’t put the baseballs into their famed humidor Wednesday. Rockies starter Jeremy Guthrie couldn’t make it out of the fourth inning, when the Giants erased a 6-0 deficit with a seven-run fourth. But that didn’t last long as Guillermo Mota came into the game and gave up five runs (four earned) in one-plus innings. Jeremy Affeldt didn’t fare much better, giving up five more runs (two earned) in two innings. The low-point came when the Rockies put up a seven-run inning of their own in the fifth. Ramon Hernandez’s single scored Todd Helton with the fourth run of the inning, then the Giants failed twice on the same play to get the third out of the inning. Angel Pagan’s throw from center was not going to be in time to get Helton at home. Brett Pill went to cut the throw off, but instead deflected it to the right of home plate. Catcher Hector Sanchez chased the ball down and threw to Affeldt covering home in time to beat Michael Cuddyer trying to score. But Cuddyer stopped short and headed back to third. Affeldt threw to Pablo Sandoval, who ran Cuddyer back toward home. Sandoval attempted to throw to Sanchez at home. But Pill, who was between Sandoval and Sanchez, thought the throw was to him and attempted to catch the ball and swipe tag Cuddyer going by in one motion, and failed to hold onto the ball. As Cuddyer scored, Sandoval picked up the ball and threw to Brandon Crawford at third trying to cut down Hernandez trying to advance. But Hernandez pulled a Houdini act in avoiding Crawford’s tag and was safe at third. That allowed the Rockies to pile on two more runs in the inning on a double by Chris Nelson and triple by Eric Young Jr., and take a 16-7 lead. We’ll try to find some other good news to report. Nate Schierholtz got his first start of the season and belted two solo home runs and added a sacrifice fly. 2B Emmanuel Burriss went 3 for 4 with three RBI. Pablo Sandoval smacked two doubles, keeping his bat hot. Buster Posey’s case of the shingles is not that serious, as Posey himself said. He came into warm up Affeldt between innings when Sanchez was getting his gear on. He also flied out in the eighth as a pinch-hitter. Despite giving up 17 runs on 22 hits, the Giants pitchers didn’t allow a home run. Small consolation, I know. Madison Bumgarner hits the start against Jamie Moyer at 12:10 p.m. Thursday in a battle of diverse ages. We’re not sure what the lineup is going to look like, but if we had to guess, this is what we’d say. Let’s see if we’re right.